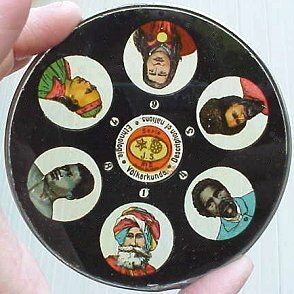 Disc slide, clearly marked with the makers name J.S., trade mark of the Nuremberger toy manufacturer Jean Schoenner. 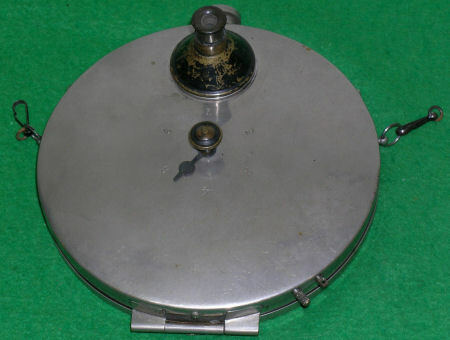 Measures 4 3/8" (11 cm) across. 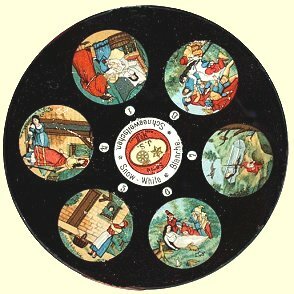 In the centre the title in three languages: Kinderleben - La vie des enfants - Child's life. 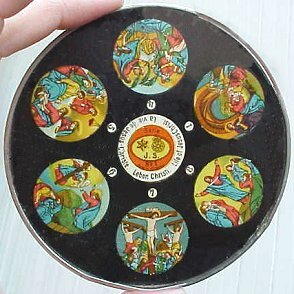 Another three disc slides made by Jean Schoenner. 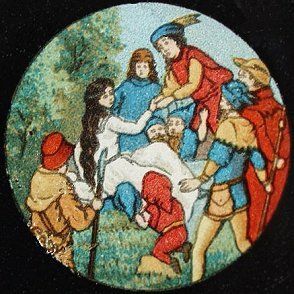 The fairy tale of Snow-White. 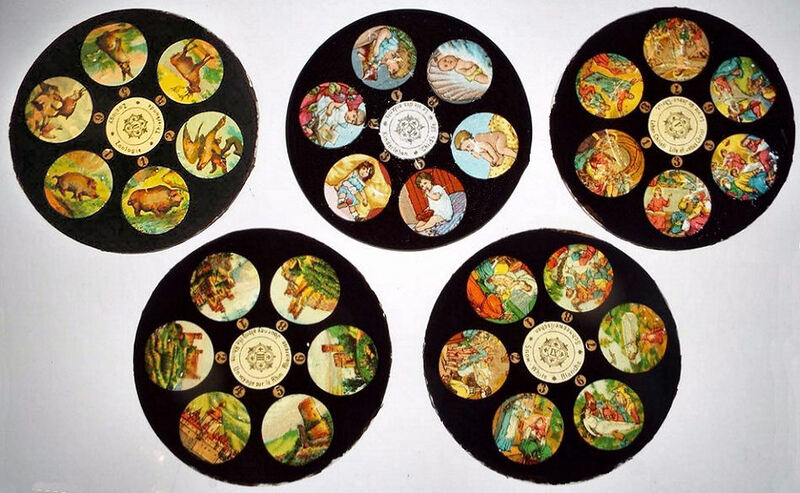 These ten disc slides all have a trademark in the centre without the name of a manufacturer. 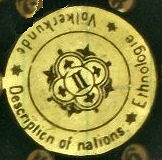 They are numbered by Roman numerals and are entitled in three languages. 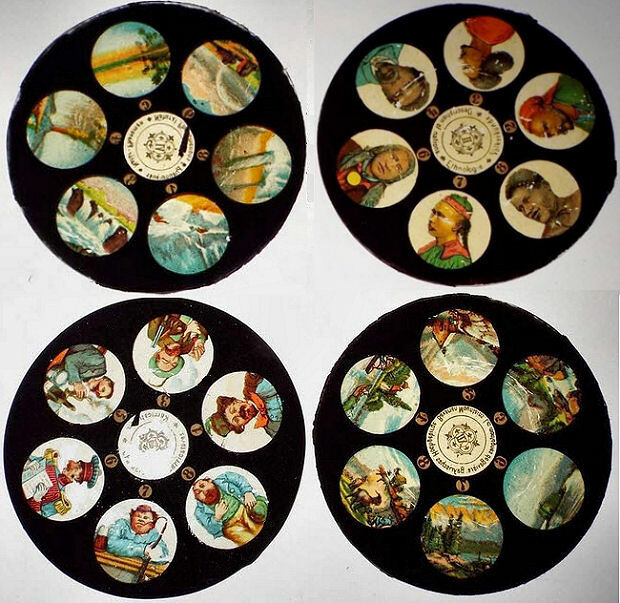 Because some images are similar to images on the discs above made by Jean Schoenner, it is plausible that these discs are also made by J.S., but others assign them to Ernst Plank. 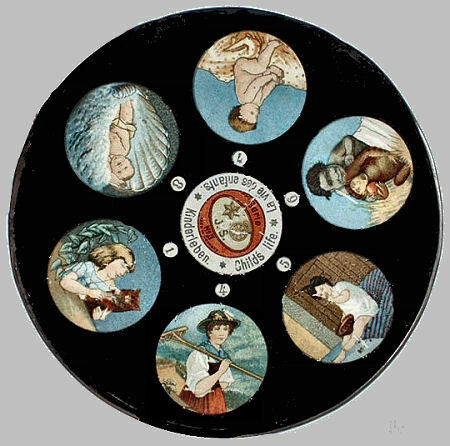 Disc-shaped magic lantern slide with a diameter of approximately 10.5 cm with a metal band round the edge. 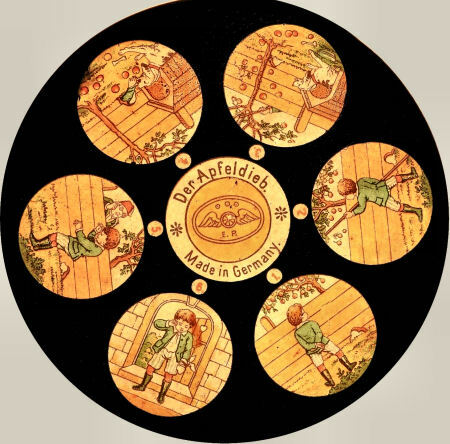 Made in Germany by the well-known manufacturer Ernst Plank; entitled Der Apfeldieb (the apple thief). 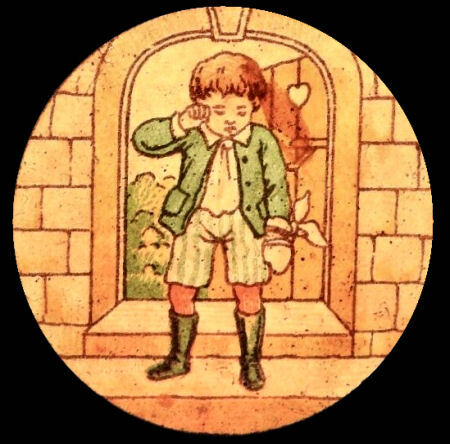 The boy tries to steal some apples from his neighbour and is bitten by his dog. 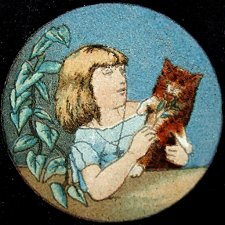 Magic lantern slide camera for 5 3/8" diameter glass discs. 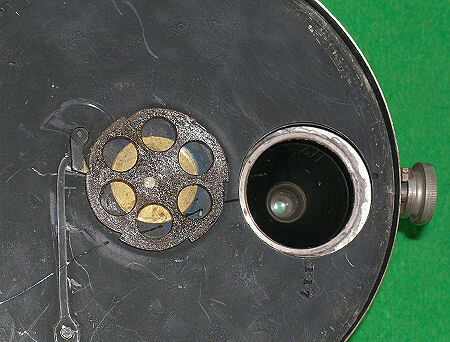 This is an extremely scarce camera used for creating round magic lantern slides. 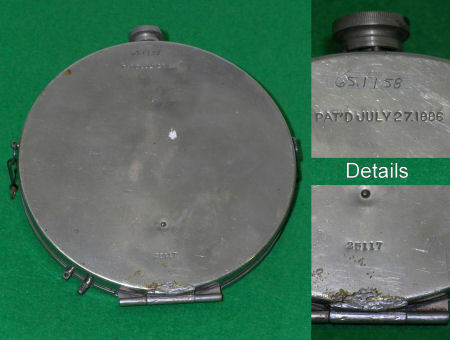 The nickel-plated camera has a patent date of July 27, 1886 and is stamped 25117 near the hinge (see details). 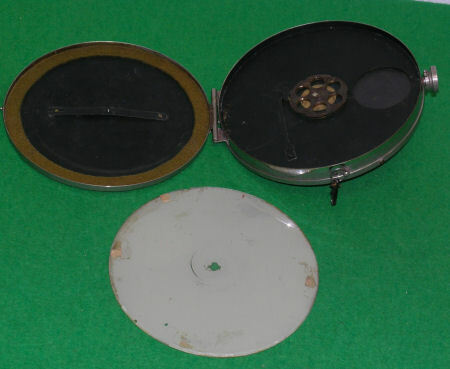 The diameter of the camera is 5,75" and it exposes up to six 1.5" diameter round exposures onto a 5 3/8” glass plate. 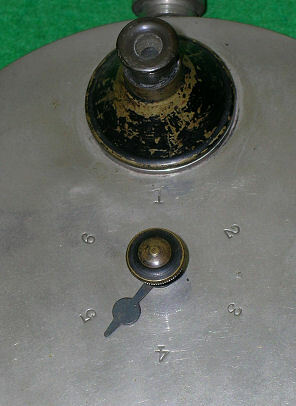 The spring-loaded shutter works by pulling the metal rod tab located near the hinge, and a ratchet attached to the 1-6 counting arrow winds the spring for the shutter. 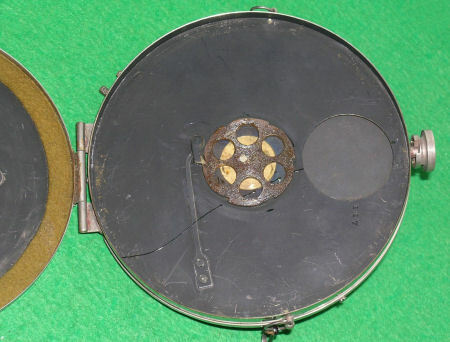 The camera has a 5 3/8” diameter round glass slide inside which has some flakes.